Right on the edge of the serene lake Sloterplas, Osdorp is a fairly middle-class suburb. It sits on reclaimed land and is known as one of the Western Garden Cities (an urban renewal project that spanned decades, beginning in the 1930s). 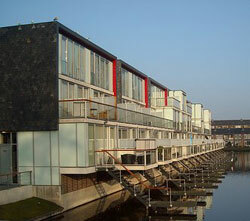 Osdorp has the highest number of owner-occupied houses in Amsterdam. These are moderate in value, but tend to be roomier than the usual Dutch house. About half of the population are native Dutch, and the bulk of the other half are migrant families. Many residents are young. In order to encourage the community spirit among its residents, the local council promotes sports events. Osdorp has a good transport system, and the town even rewards motorists: parking is free and it’s often the best way to get around the district. It has spacious parks, but its biggest claims to fame are the Bunker (a criminal court), and the Meervaart, a popular theatre in the middle of the district.